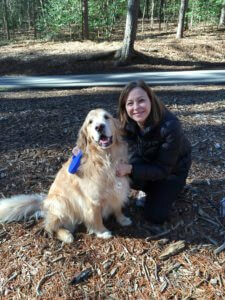 I had never even thought about being a part of a Pet therapy team until my Golden Retriever Bentley inspired me. 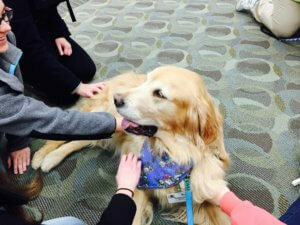 His gentle soul and calm demeanor led me to seek out the Wagtime program at Akron City Hospital in Akron, Ohio. Bentley and I were a proud Pet Partners team for six years from 2011-2017. I am grateful beyond words that we were part of something so meaningful, and as all who have done this know, it creates a bond between you and your best friend like no other. I hold close to my heart many wonderful memories of visits with patients and their families who needed comfort, and nurses who needed a big paw shake. He went into every hospital visit with great anticipation and a spring in his step. Bentley had a heart of gold and he gave comfort with such ease because everyone he met could feel his genuine love. I was honored to walk beside him and be a part of the joy he gave to others through his peaceful and soothing presence. I lost my sweet Bentley boy to cancer on July 4th, 2017, just 3 months after he passed his final Pet Partners evaluation. We were both ready for hopefully 2 more years of visits, but God had a different plan. Recently when I went to purchase a weeping cherry tree to plant in Bentley’s honor, I told the young girl at the counter that I was planting this tree in honor of my therapy dog. She asked his name and when I told her it was Bentley, she remembered his visit when her sister was in the hospital 2 years ago. She reminded me that you never know how many lives he had touched. I was truly blessed to have Bentley in my life, and his big heart has forever changed me. In memory of my sweet Bentley boy. Always with me.